New Alabama Power Political Consultant Played Big Role In Chip Beeker Campaign » Mr. Dunn Goes to Montgomery | Who's Behind the Mask? Questions: Was the Beeker-Ross arrangement a violation of Alabama’s campaign laws? Should a candidate for the PSC allow a consultant for Alabama Power to even get close to his campaign? If not Beeker, did someone else pay Ross? Note: This is my second story in the past week and, for that matter, since Chip Beeker defeated incumbent Place One PSC Commissioner Terry Dunn in the July 15 Republican primary. In December, on the event of Beeker’s first meeting, the PSC approved a rate increase of almost 5 percent for Alabama Power. With Dunn gone, there was no one to so much as present a speed bump to the increase. Imagine that a candidate for a state agency that regulates the rates charged by utilities won election with substantial help from a political consultant for the state’s largest utility. To this, add: With one early, minor exception, the candidate’s campaign did not have to pay the consultant. The power company’s consultant worked — days, nights, even weekends — for free! What’s more, the candidate — with a few exceptions that actually make the situation look worse — concealed the consultant’s services in his required campaign disclosures. And if all that wasn’t bad enough, at the candidate’s first ever public meeting in his new position, he didn’t make a peep when the commission rubber-stamped a significant rate increase for the power company. Hardly surprising, really, when you consider that the above occurred in Alabama, which long ago turned political conflicts of interest into an art form. Alabama Democrats were blind to conflicts, but if you thought things would change when the Republican Party took over, you would be wrong. This year’s model is Chris Beeker. 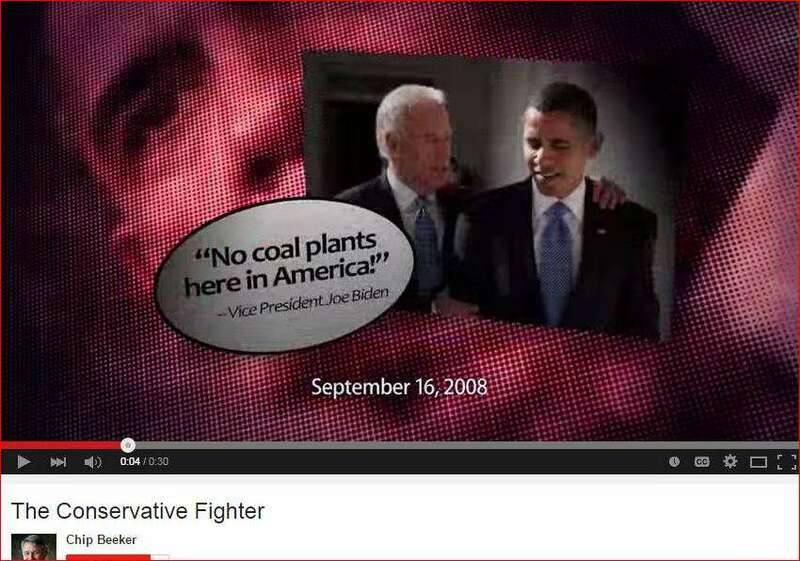 This image comes from Chip Beeker’s television ad, “Plan for Alabama.” It’s notable, like Beeker’s other ads, for its angry attacks on Obama. To state the obvious, the Alabama Public Service has no authority over the President of the United States. And it’s the PSC — not the federal government — that allows Alabama Power a profit level of close to 14 percent, far higher than the national average of less than 10 percent. Beeker is a catfish and cattle farmer and former Greene County Commissioner. Almost from the moment he announced his intention to run against Dunn, it was clear that Beeker would be the “Alabama Power” candidate. Utilities are prohibited from contributing to PSC elections. But it’s never a secret which candidates are backed by the power company. They’re the ones with bulging campaign accounts and big donations from the coal industry and major Alabama Power suppliers and vendors. 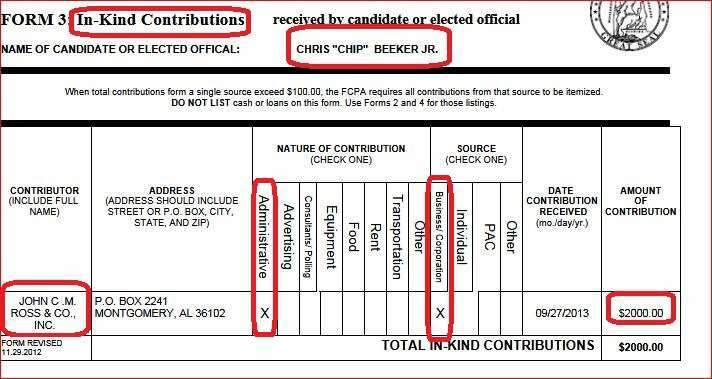 Beeker, not including personal loans and loan repayments, received some $540,00 — a record sum for a candidate running for the Alabama PSC. That sum does not include hundreds of thousands of dollars and quite possibly millions spent on political consultants and shill groups, like 60 Plus, JobKeeper Alliance, and Coal Jobs Count, whose activities on behalf of Beeker and against Dunn were substantial. Yellowhammer News praised Beeker for impassioned political speech before PSC. Dunn’s meager campaign was almost entirely self-financed. He received less than $2,000 in contributions. — Summarize the political and lobbying career of John Ross and the influential political consulting firm of which he is a founding member, including its long-time services for Alabama Power. — Examine the extraordinary close relationship between Ross’s firm and Dunn’s foe on the commission, PSC president Twinkle Cavanaugh. — Present evidence showing Ross’s role in the Beeker campaign. 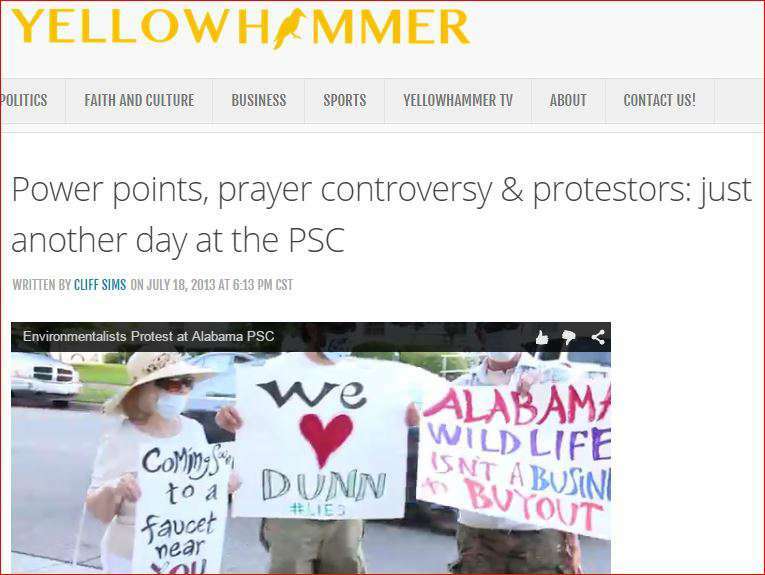 –– Present evidence showing financial and work product connections between Swatek Azbell Howe & Ross and Yellowhammer News, the popular, conservative Alabama political news web-site that played significant roles in the smear campaign against Dunn and the promotion of Chip Beeker’s as the conservative choice for the PSC. — Make my case for why Beeker and perhaps others — including Alabama Power — should be investigated for criminal violations of the Alabama Fair Campaign Practices Act. — Discuss the likelihood that Alabama Attorney General Luther Strange would open an investigation that even might lead to Alabama Power. Who is John Ross, and what are his, and his firm’s, connections to Alabama Power? Ross began working for Gov. Bob Riley in his early 20s and impressed all who came in contact with him. Chief among those was State Rep. Mike Hubbard, one of Riley’s political acolytes and a leader of the Republican minority of the state house of representatives. In 2007, Hubbard added a new title — chairman of the Alabama Republican Party. The stated goal was to overturn the Democratic majorities in the state House and Senate that had existed since Reconstruction. If Ross wasn’t already a top-level campaign professional in 2007, he certainly became one as executive director of the party. In the November 2010 elections, Republicans won every statewide race, gained two congressional seats and captured the majorities in the House and Senate. The party, under Ross’s direction, routed the Democrats. 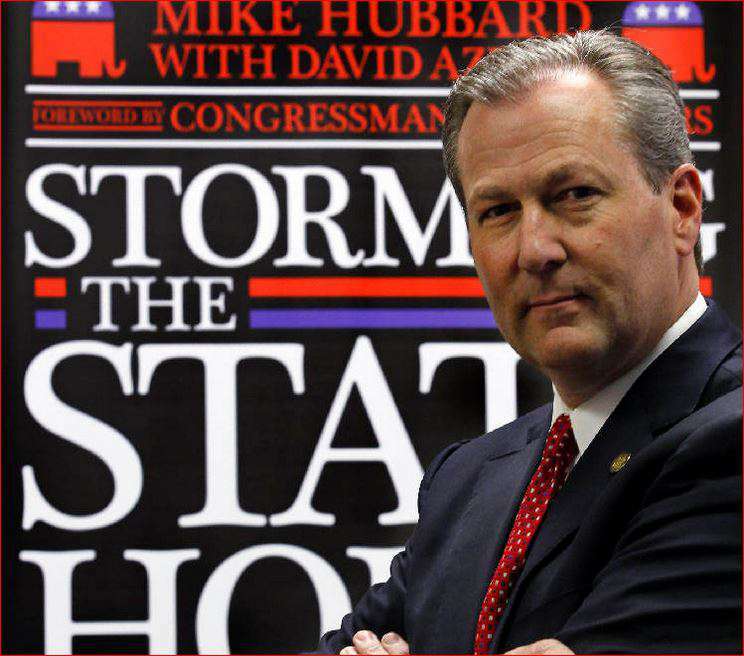 Hubbard, standing before a placard of his book “Storming the Statehouse.” It was co-written by Ross’s partner, David Azbell. After the wildly successful November elections, Ross and three key Hubbard loyalists — Dax Swatek, David Azbell and Tim Howe — formed a new lobbying/political consulting firm, Swatek Azbell Ross and Howe, or SAHR. Technically, the four partners of SAHR are four corporate entities, one for each partner. For example, Ross operates through John C. M. Ross & Co. Inc. Ross, Howe and Swatek are each registered to lobby for Swatek, Azbell, Howe & Ross, which in turn is registered to lobby for some 25 corporate clients as well as — complicated as it sounds — the individual member of firms of Ross, Swatek and Howe. They operate like a blender — at the end of the day, they’re all one. Though the contract is technically with Azbell’s firm, other members also participate in providing the described services to the Republican leadership. Every year, Yellowhammer News publishes its list of the 40 most influential people in Alabama politics. Here’s the description of Ross from the 2013 list, which also included Azbell and Swatek. SAHR announced its formation with a press release in early January 2011. Al.Com did a story on the new firm. “What sets us apart is our collective experience and connections with the new Republican leadership,” Swatek told the reporter. The clear message from both: The Democrats are out, the Republicans are in, we played a big role in that, and we are super tight with the people now in charge. In short, we are in, brimming with political connections and influence. It’s time to cash in! Both the press release and subsequent news story listed some of the top clients already on board with the new firm. First on the list were Alabama Power and SouthernLINC Wireless, the cell phone company that is, like Alabama Power, a subsidiary of the Atlanta-based Southern Company. Southern Company was subsequently added to the firm’s client list. Here’s the list of the firm’s top clients from the SAHR website as it is now and has been for some time. The National Association of Regulatory Utility Commissioners (NARUC) is, as its name suggests, the national association of utility regulators. PSC members from throughout the country, along with hundreds of others with interests in utility regulation, including company officials, attend its annual meetings. For example, all three PSC members from Alabama — Cavanaugh, Oden and Beeker — are attending the February 2014 NARUC Winter Meeting in Washington D.C. 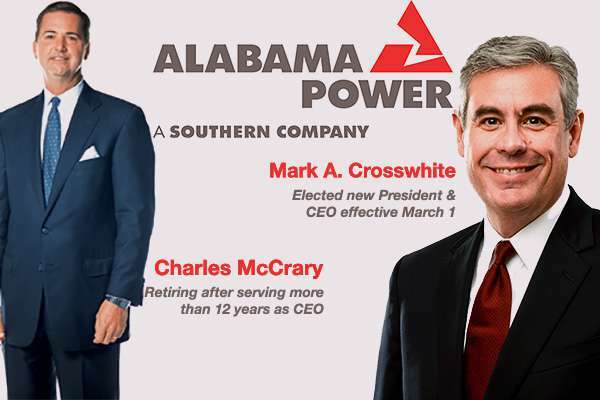 So two are Alabama Power VPs Nick Sellers and Zeke Smith, the two company officials most responsible for the company’s relations with the PSC. At least one lobbyist/political consultant from Alabama attended as well. First: Ask yourself, what sort of client would a lobbyist/political consultant have to have in order to attend a national meeting of utility regulators? And who, at the end of the day, pays for travel and hotel and the $520 registration fee for the three day event in D.C.? Here’s the banner for this year’s event, and three of the more than 1,000 registered to attend. One is a subject of this story, and two others should be familiar to anyone who has read other stories on this site or followed the campaign against Terry Dunn and the connections to that campaign by Alabama Power. 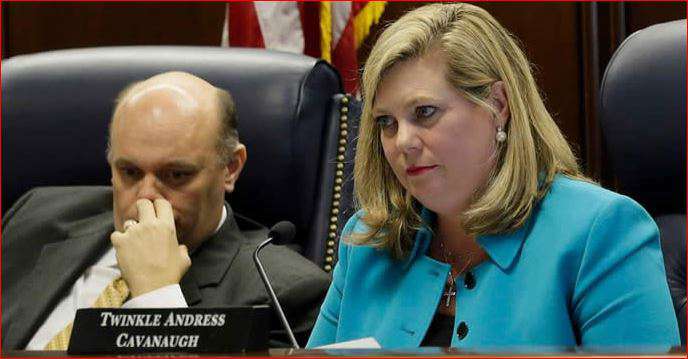 Among the “right people in Montgomery” Ross and his firm had an especially tight relationship with was Twinkle Cavanaugh, in 2010, a newly elected PSC commissioner, and, since 2012, the PSC president. For a firm representing Alabama Power, it’s hard to top that relationship. 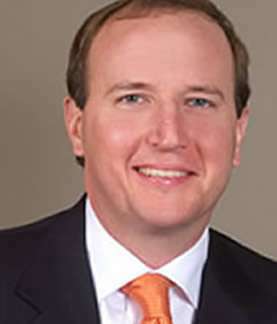 Years before, Cavanaugh preceded Mike Hubbard as chairman of the Alabama Republican Party. While in that position, she hired Tim Howe to be executive director — the job Ross would later assume. According to Terry Dunn, Howe was a fixture on the eighth floor of the RSA Union Building, which houses the commission offices. His destination: Cavanaugh’s suite of offices. “Tim Howe was up there about every day. He would be up there first thing in the morning,” Dunn said. Dunn’s chief of staff David Rountree held the same position for Democrat commissioner Susan Parker. After Dunn defeated Parker, he met Rountree, was impressed, and kept Rountree on. Rountree — who years before was chief of staff for Republican PSC President Jim Sullivan — said he’d never seen Howe until 2010, after Cavanaugh was first elected. Rountree knew Howe wasn’t on Cavanaugh’s staff. Due to the regularity of Howe’s visits, and his professional demeanor, he assumed Howe served Cavanaugh in some advisory capacity. In early 2013 — after Dunn publicly urged the commission to hold rate hearings and consider curbing Alabama Powers profits — the frequency of the Alabama Power consultant’s visits to the 8th floor picked up markedly, Rountree said. “After all the stuff got started” — a reference to the attack campaign against him and Dunn — Rountree “began to see a lot more of” Howe,” he said. Rountree said he spoke to Howe twice, received no response, and never again tried. 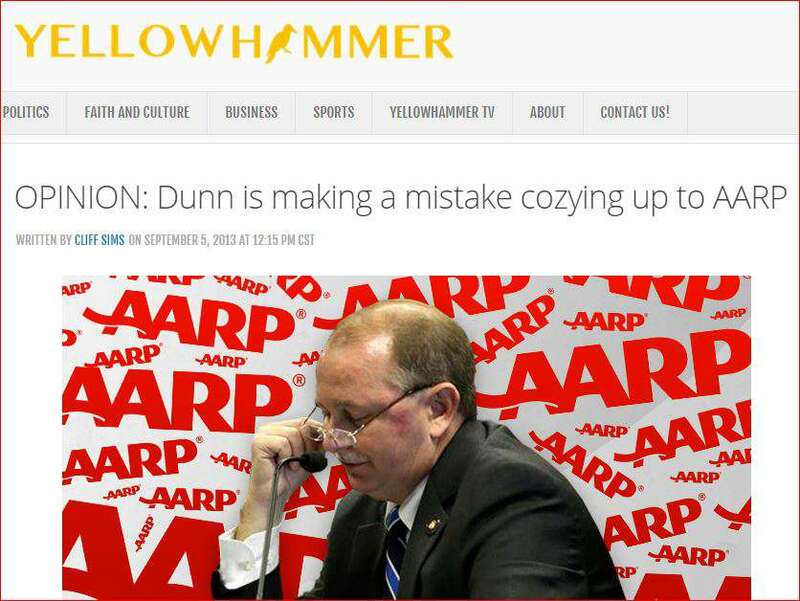 Below is one of the many false and disparaging images created by Yellowhammer News as part of its campaign to destroy Dunn’s reputation among conservative voters and help Chip Beeker win the 2014 race. I believe that Yellowhammer News was the created by Swatek Azbell Howe & Ross as a means of promoting the interests of its corporate and political clients, and, especially, the man to whom the firm owes so much of its pull in Montgomery — Mike Hubbard. 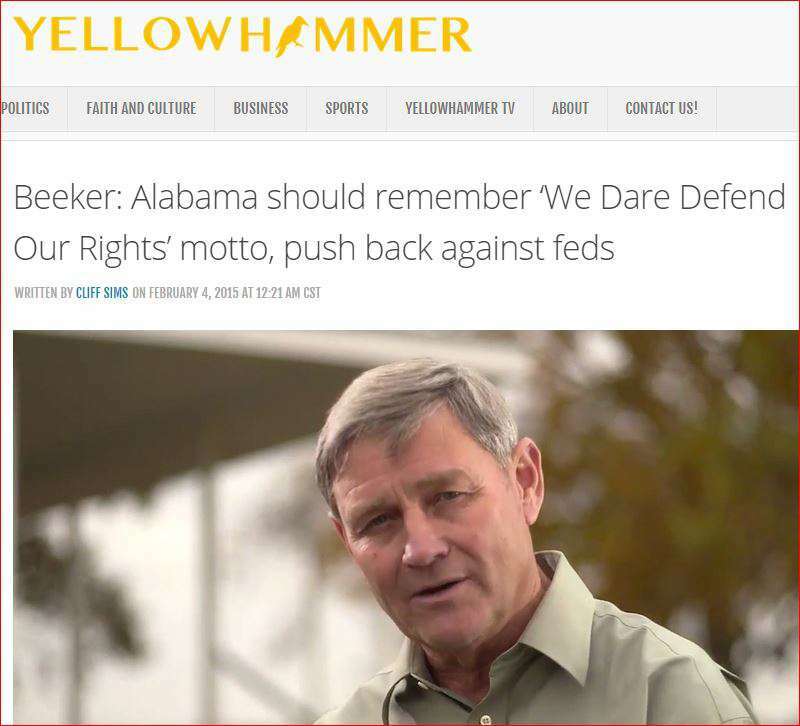 I believe that the firm provides a substantial amount of funding for the site; and that members of SAHR secretly author many of the stories attributed to Cliff Sims, the head of Yellowhammer News. None of that would shock people who pay close attention to Alabama politics. Some even believe that Mike Hubbard secretly owns Yellowhammer, so fawning is its coverage of the speaker. But there’s a big difference between thinking something and proving it. I think it would be a great political story if it could be proved, and hope one day to do that story. Each of Beeker’s first three campaign finance reports — covering August, September and October of 2013 — reported “in-kind contributions” of $2,000 from John C.M. Ross & Co. Inc.
An “in-kind contribution” is a catch-all category for contributions to a candidate that are not purely monetary. The definition in the law states than an in-kind contribution is made when equipment, furniture, office space, or some other item of value other than money is contributed or used; and that a reasonable market value for this contribution should be disclosed on the campaign reports. Below is the first such disclosure. Importantly, the contributor on this and the other two reports is shown as being John C.M. Ross & Co, and not Ross individually. The other two reports state that the services were in the “consulting/polling” category. 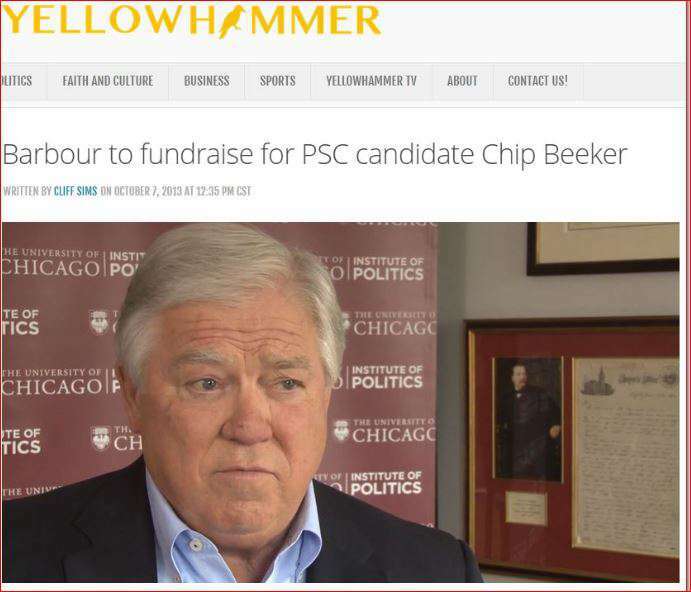 In November 2013, I published a story on this site noting the fawning manner of the coverage by Yellowhammer News when it reported that Southern Company lobbyist and former Mississippi Governor Haley Barbour was coming to Mountain Brook to host a fundraiser for Beeker. The AP’s Phil Rawls provided a somewhat different take than Yellowhammer. After the fundraiser, a giddy Beeker posted a photo of himself with Barbour on his Facebook page. As a matter of routine, I continued checking Beeker’s campaign reports. He would would go on to sign some 20 more monthly and weekly reports in addition to his recently filed annual report covering 2014. In not a single one of those reports is Ross or his firm mentioned again. I later noticed an expenditure I’d missed — a $500 payment by the Beeker campaign to John C.M. Ross & Co., in Sept. 2013 and in the “consultants/polling” category. The final time Ross’s efforts for Beeker’s campaign were disclosed, then, was on the October 2013 report, filed in early November 2013. At that point, the campaign had hardly begun. It was of course to dramatically pick up steam in the winter and spring of 2014 and the weeks preceding the June primaries. Dunn had four challengers in the Republican primary (no Democrats ran for the spot). Beeker won the primary, but Dunn was a close second, forcing a July 15 run-off. That meant not just more campaigning, but more intense campaigning, especially by the well-funded Beeker campaign. Another fawning piece on Beeker. Yellowhammer News (perhaps John Ross?) was there, video camera in hand, to record the event of U.S. Sen. Jeff Sessions endorsement of the Alabama Power candidate, Chip Beeker, two weeks before the run-off. I am doing this project on a volunteer basis, I rarely go to Montgomery, and have made no great attempt to maintain sources there since I stopped reporting in 2007. Were that otherwise, perhaps I would have known more about Ross’s services for the Beeker campaign. As it was, I trusted the campaign reports. They are, after all, signed under penalty of perjury. I assumed, based on those reports, that Ross concluded his involvement in the Beeker campaign in October 2013. I recently discovered otherwise, and from a surprising source. On its web-site, the Public Service Commission posts videos of its monthly meetings. I sometimes decide to bore myself to death and watch them. Early in the Dec. 2 meeting, Twinkle Cavanaugh welcomed the commission’s newest member and invited him to say a few words. He then made three exceptions, identifying by name three people who he said gave greatly of themselves to help him get elected. They were: His wife, his oldest son, and, to my considerable surprise, John Ross. Again, and you can’t say it too many times: Ross is a political consultant for Alabama Power, and Beeker was running for a position on the state agency that regulates that company’s rates. Beeker’s description of the importance to his campaign and the amount of time spent on it by Ross prompted me to embark on a more thorough review of Beeker’s campaig. That review produced additional evidence of a significant role by Ross and the Swatek firm in Beeker’s campaign. Beeker’s campaign filings show that the bulk of his expenditures were for advertising. Campaigns — in any event, well-funded ones — often hire companies that specialize in political advertising, Those companies design the ads and also purchase air time from TV stations. From December 2013 to July 2014, the Beeker campaign made payments totaling $425,128 to McLaughlin. The following record, from the Alabama Secretary of State web-site, shows all the payments by the Beeker campaign to McLaughlin & Associates by amount and date. How, do you suppose, did Chip Beeker — Greene County businessman — become familiar with a big national player in the political polling and advertising business? The answer to that question can be found on the Swatek Azbell Howe & Ross web-site. 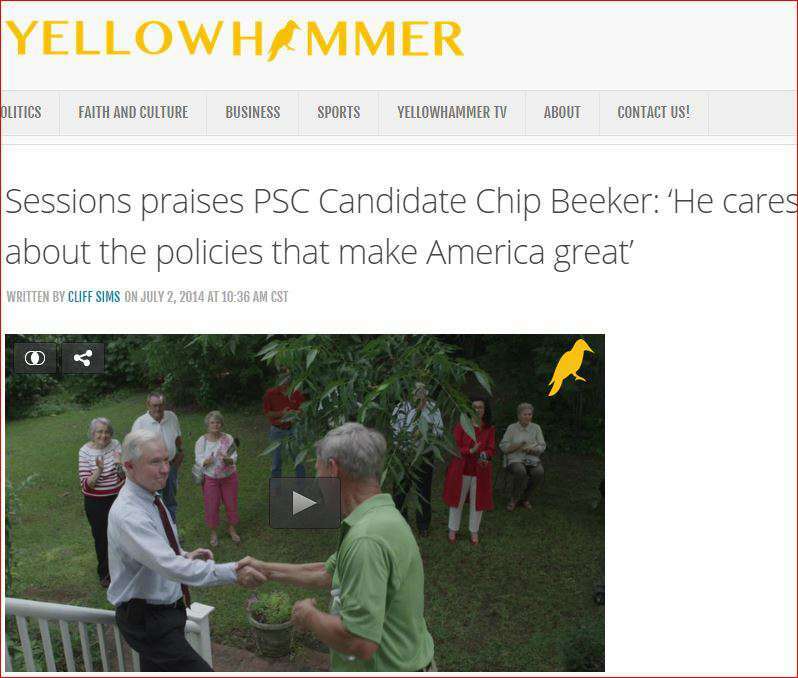 Clearly, Beeker’s consultants decided that the best way to appeal to Obama-hating Alabama Republicans was to establish in voters’ minds this one thought: PSC candidate Chip Beeker hates Obama. 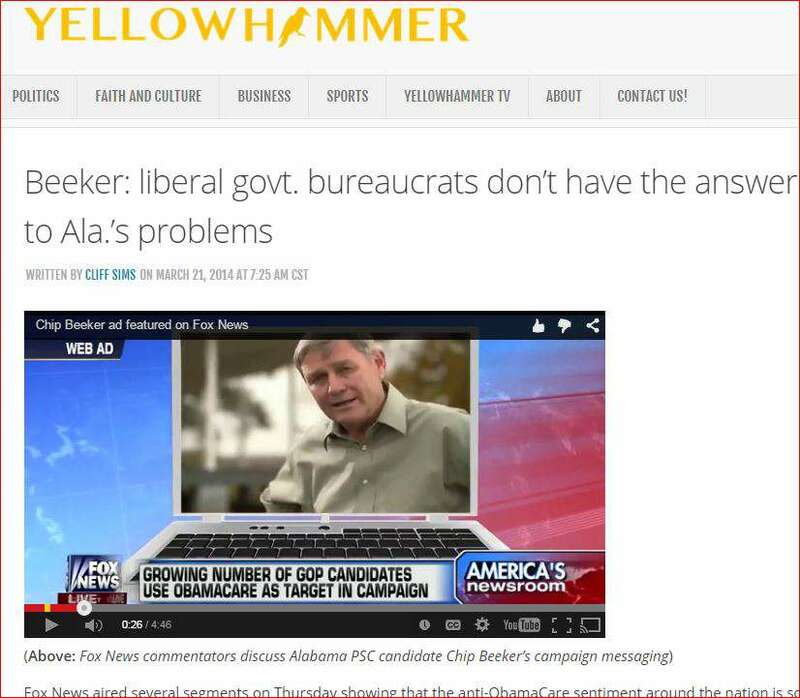 The attention to the Beeker campaign by Fox was dutifully reported by Yellowhammer News. 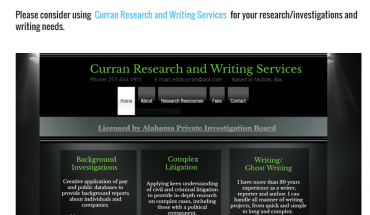 “Ghost Writer” was revealed as the pen name for Tm Howe — Alabama Power consultant, partner of John Ross, regular in the office of PSC President Twinkle Cavanaugh, and, says my money, secret author of some of the Yellowhammer News stories attacking Dunn and praising Beeker and Cavanaugh. Below are excerpts of the e-mail, with emphasis mine. Notice that Dax — as in, Howe’s partner, Dax Swatek — is referred to. Check this out and add some thoughts when you have a sec. Then maybe we can either show to Dax for his feedback or give it to the video guy. I’d like to get him something in the morning one way or another so we can get rolling. Hybrid political ad / mini-doc. Touch some emotion, be inflamatory, but help people understand the issue in 3-4 minutes. – There are good guys: Twinkle Cavanaugh & Jeremy Oden, conservativeleaders who are fighting back, Dale Earnhardt, Jr., etc. – This effects 5,000 coal industry jobs in Alabama directly, touches every single person with a power bill because electricity rates will skyrocket,and also effects jobs all over the state. The Good Guys: Commissioner Jeremy Oden, left, and PSC President Twinkle Cavanaugh. The competition is stiff, but for my money, the single sleaziest act in the entire, meticulously crafted anti-Dunn campaign occurred on July 17, 20113. That morning, a group of masked “environmental protesters” showed up outside a PSC meeting devoted to Alabama Power. Everyone involved, top to bottom, deserves to be exposed. The ringleaders — who I’m working on identifying — arranged for one of the posters to praise Dunn by carrying a sign that said, “I Love (stated with a heart) Dunn.” That protester — wearing a beard and mask — was intended to look like Nelson Brooke, a well-known Alabama environmentalist who sometimes attends PSC meetings. 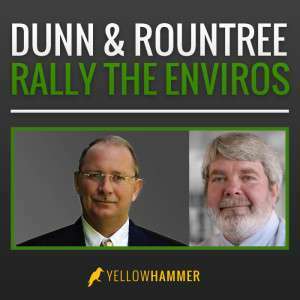 The image of the bearded protester with the Dunn sign was used to great effect by Yellowhammer and other Alabama Power shill groups to falsely link Dunn to liberal environmentalists and thus tarnish him in the eyes of conservative voters. It’s my understanding that the bearded fellow with the Dunn poster was the link to the political operatives who conceived the protest plan. He approached some young, liberal minded artists, asked them to gather some friends, and attend an environmental protest. It’s my understanding that the young people were told they were going to participate in a large environmental rally, and were taken by a van from Birmingham to Montgomery. They were, I’m told, confused when they were taken to the sidewalk in front of the RSA Union building, only to discover that they comprised the entire protest. They were duped, but so far, none have been willing to tell tell their story on the record or identify the bearded ringleader. The cameraman who videotaped the protest and portions of that day’s PSC meeting told me he had worked with Sims and Tim Howe on previous Yellowhammer projects was contacted by Sims to take the video used by Yellowhammer. He told me he was directed by Sims to photograph the protest that Sims, somehow, knew ahead of time would occur that morning. Sims, who was not there, called the cameraman that morning to make sure he took video of the bearded protester with the Dunn sign, the photographer said. There was at least one other cameramen shooting the protest, and whose images and video were used by shill groups connected to the political consulting firm Matrix LLC. That firm and its founder, Joe Perkins, have provided political consulting services of an unknown nature to Alabama Power and its top executives for more than 25 years. The “protest” started after the meeting began and disbanded before the meeting concluded. As a result, few were even aware of it. 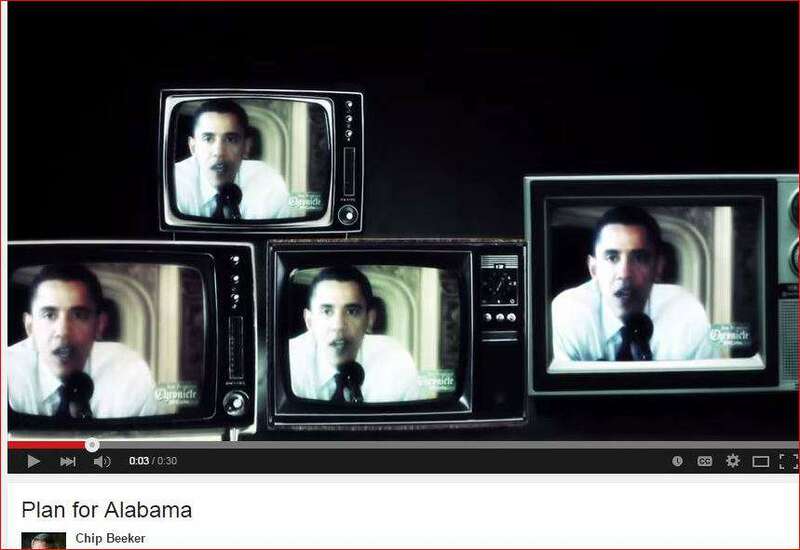 The sole purpose was to generate video and images and bogus news for Yellowhammer and the Alabama Power shill groups. I suppose the political operatives felt they needed it. They had zero evidence linking the three time delegate to the national Republican convention with the environmental movement, including no statements ever by Dunn criticizing the use of coal by Alabama Power or anyone else. Chief among the uses of the bogus evidence was to harm Dunn’s re-election chances and boost Beeker’s. 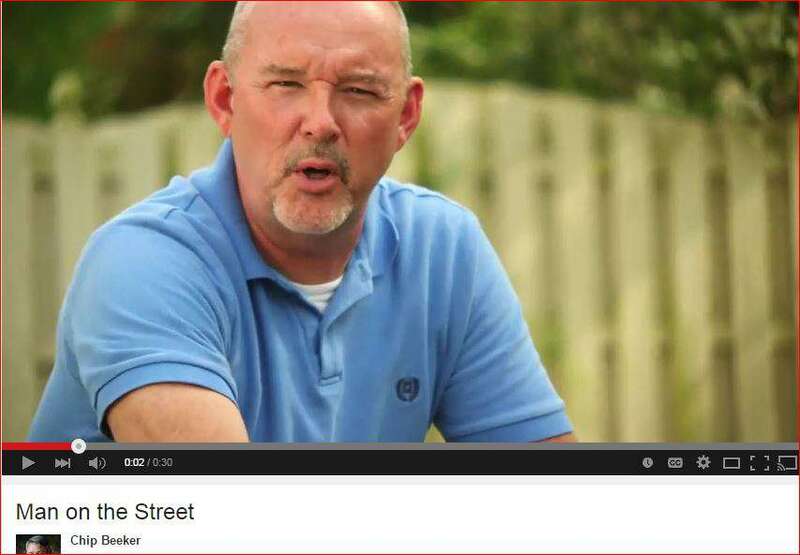 The photographer who took the Yellowhammer video told me he was paid for his efforts that day by the Swatek firm. To support this claim, he provided a copy of a tax form sent him in 2013 and related to payments made to him in 2012 for another Yellowhammer project. Here’s the top of that form, called a 1099-MISC. I’ve removed identifying information for privacy purposes. Here’s the e-mail to which that tax form was attached. It’s to Yellowhammer’s Sims from a secretary at Swatek Azbell Howe & Ross. While I only have documentation of that one payment by the Swatek firm for expenses incurred by Yellowhammer, I’ve no doubt it’s the tip of the iceberg. 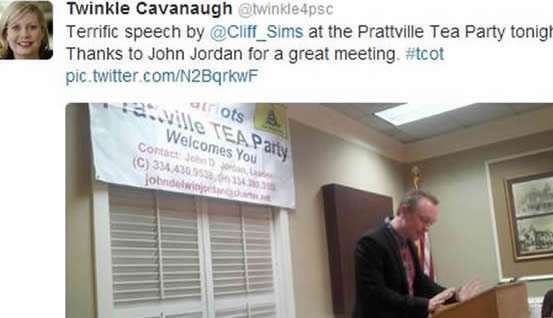 Below, PSC President Twinkle Cavanaugh “tweets” praise for Yellowhammer’s Cliff Sims. First, let’s examine aspects of the law that I believe this story has largely proved were violated by the Beeker campaign. Then we will look at more serious violations that I believe occurred but for which I presently lack the documentation and/or investigative resources to prove. (d) Each report required by this section shall be signed and filed by the elected official …. There shall be attached to each such report an affidavit subscribed and sworn to by the official or … candidate … setting forth in substance that such report is to the best of his or her knowledge and belief in all respects true and complete, and … that he or she has not received any contributions or made any expenditures which are not set forth and covered by such report. Beeker was a Greene County commissioner for 20 years, and had previously run for state office. He is a veteran politician who has no excuse for not having a strong grasp of the campaign practices act. Ross is unquestionably one of the most prominent and knowledgeable campaign professionals in Alabama. A declaration by either that they didn’t understand the law or its requirements would be laughable. In this modern age, campaign reports are filed electronically and “electronically signed.” In no way does this relieve the candidate of the burden to be the one responsible for the accuracy of his or her campaign’s report. Below is the signature portion of one of Beeker’s reports. The language above the “electronic signature” is important. Alabama’s campaign law does not nor should it require disclosure of all assistance and goods provided to a campaign. Every campaign has volunteers — friends, family, believers in the cause, etc. — who donate their time. Such activities are not considered “contributions” as defined by the campaign law, and nor are the travel costs of a volunteer. And candidates are not required to pay for or report as an in-kind contribution when a volunteer provides the use of his or her home or business, such as for campaign-related events. 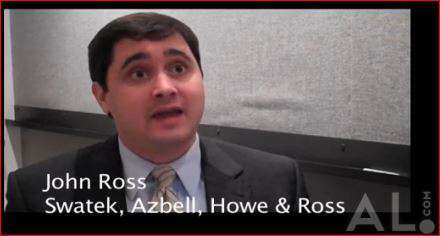 John Ross, in 2011 Al.Com video talking about the formation of Swatek Azbell Howe & Ross. The question thus becomes: Could John Ross and Chip Beeker plausibly assert that Ross’s efforts for the Beeker campaign were exempt from disclosure because they did not fall under the law’s definition of a contribution? In other words, that Ross’s services were purely voluntary, not professional in nature, not connected with Ross’s and his firms clients, and similar in spirit to the sort of efforts that relatives, friends and supporters of candidates routinely make. When asking that question, consider the following: For the August, September and October reports, Beeker and Ross placed a value of $2,000 a month on the services of Ross’s firm, and once paid the firm $500. Only one conclusion exists for Ross’s firm appearing on Beeker’s first three reports: That both Beeker and Ross determined that the services provided by John C.M. Ross & Company were of a nature that required disclosure. 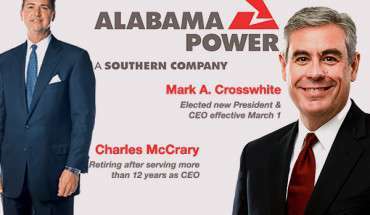 The shenanigans against Terry Dunn and on Chip Beeker’s behalf began in early 2013, when Charles McCrary was Alabama Power’s President and CEO. Last March, McCrary retired, and was replaced by Mark Crosswhite. I thought a new man at the top might mean a new day. It did not. The Alabama Power tradition — getting others to do its dirty work while hiding behind smiling faces and ethical personas — shows no signs of slowing down. I’m not going to claim that my web-site is seen by some vast number of people. It’s not. But it is seen by some, including — as I know for a fact — people at Alabama Power. 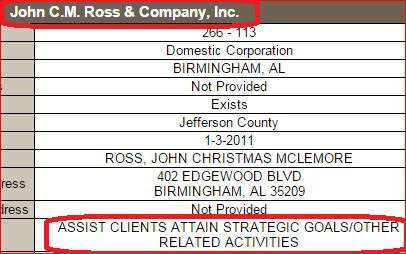 As noted above, I had reported in November 2013 that Ross’s firm was providing free services to a candidate for the PSC and that his firm also provided political services to Alabama Power. I don’t think there is any question but that the Beeker campaign — for which Beeker is responsible — made a calculated decision to violate the disclosure requirements by ceasing to put Ross’s firm on the reports. Whether this was done to prevent me from continuing to report on Ross’s involvement of someone else, such as a reporter with one of the state’s newspapers, I can’t say. But that decision was made. Why, then, did Beeker publicly thank Ross at the PSC meeting? I think Beeker was carried away with the thrill of the moment — his first remarks at a real live PSC meeting, him as an elected state official! And as I’ve stated elsewhere on the site, I suspect that in some respects, he’s a bit of a simpleton. A politically ambitions simpleton, but one nonetheless. I don’t say that to be ugly, but it’s the only explanation I can come up with for some of his statements both while a candidate and since coming to the commission. What if Alabama Power were involved? 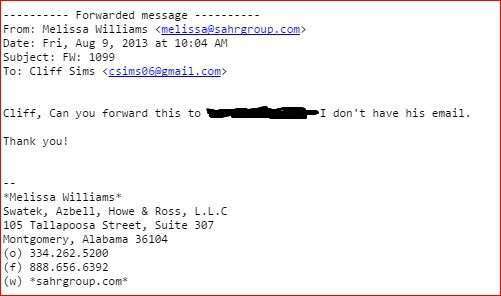 A whole other can of worms would be opened if it were determined that fellow members of the Swatek firm were working with or through Ross on the Beeker campaign or that Ross was in paid and/or reimbursed for his “volunteer” services, be it by his own firm or the “mother firm” of SAHR. As stated before, I believe the facts show that Beeker knowingly violated the Alabama Fair Campaign Practices Act by by failing to report Ross’ services. But if this second level of wrongdoing occurred — as in, a person or company paying for Ross to work on Beeker campaign — Beeker could only know if he were told. He would have to be an imbecile — or acting with willful ignorance — if he failed to ask why a campaign professional of Ross’s stature, and with his specific clientele, would devote so much time to his campaign. But if he asked and wasn’t told, I have to believe he could not be held responsible for such a violation. If Ross was paid or reimbursed, or his work for Beeker’s was part of an arrangement with a client, then the violators of this aspect of the law would be Ross and those who paid him or had such an arrangement with him or his firm. Another campaign law at play here is the prohibition against utilities regulated by the Public Service Commission from making contributions in PSC campaigns. Specifically: Were John Ross’s services for the Beeker campaign made in conjunction with any financial relationship that existed between Ross/his firms and Alabama Power or its affiliated companies, or other funding sources controlled by Alabama Power? Is that an unfair question to ask, given the circumstances? If Alabama Power were found to be involved, the violations would be of such a severity that people would, or should, go to prison. The company says not. This comment came in response to a reporter’s question last summer after Dunn said he believed that Alabama Power was behind the smear campaign against him. Prosecutions of violations of Alabama’s campaign laws are rare but not unprecedented, as shown by the 2010 case against state Board of Education candidate Troy Smithwick. Smithwick was in that class of candidates that’s been created by the almost total takeover by the Republican Party of Alabama politics. The Republican Party claims, and with some cause, that candidates who are actually Democrats and backed by the Alabama Education Association are running as Republicans. That’s not illegal. The criminal case centered on a contribution of $100,000 from, “The Real Democrat PAC” during his failed 2008 Republican primary campaign. Smithwick listed the donation as coming from the Tennessee Valley Citizens for Economic Development PAC. The implication was that Smithwick was trying to conceal his ties to the AEA, which is unpopular among many Republicans voters. Beeker, it should be noted, won his election to the PSC. If the commission on which he serves were to bring the astonishingly profits the PSC allows Alabama Power down to national the average it would have an annual financial impact in the hundreds of millions of dollars — to consumers instead of to Southern Company shareholders. Such an action by the PSC would be a blow both to the company and the political consultants paid immense sums to prevent it from happening. 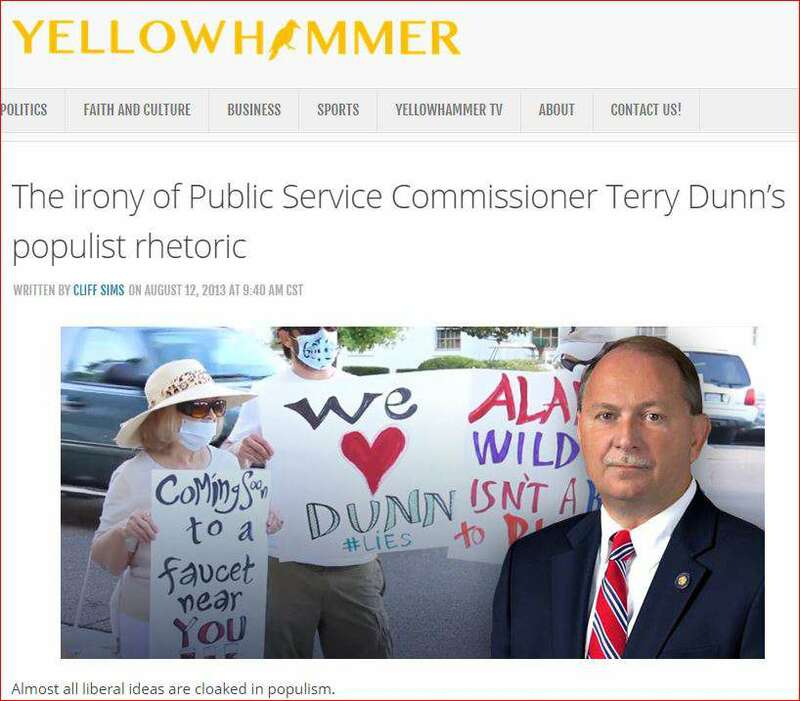 If Dunn’s story tells us anything, it’s what happens to any PSC member who crosses Alabama Power — the entire machinery of political consultants and shill groups comes at you with guns blazing. I believe the facts presented in this story and elsewhere on this site warrant a thorough criminal investigation. That brings us, unfortunately, to the Alabama Attorney General’s office. AG Luther Strange is famously ambitious. That translates into a hunger for campaign contributions, be it in a future race for governor or U.S. Senator And in this state, there’s only one kingmaker. Not only does Alabama Power serve as a major contributor, but it plays a huge role in dictating the contributions from all manner of other corporations and key donors and trade associations. Strange might as well be on all fours and wearing a leash. There is zero chance that he will become the first Alabama politician in decades — Dunn excluded — to dare cross the Power Company. Last year, Alabama Power’s employees PAC donated $50,000 to Luther Strange’s successful re-election campaign. Drummond, the coal company, is Alabama Power’s political twin at campaign donation time. Drummond also donated $50,000 to Strange’s campaign. In his first term as AG, Strange — like other AGs before, Democrat and Republican — abdicated his office’s role to serve Alabama Power customers before the Public Service Commission. 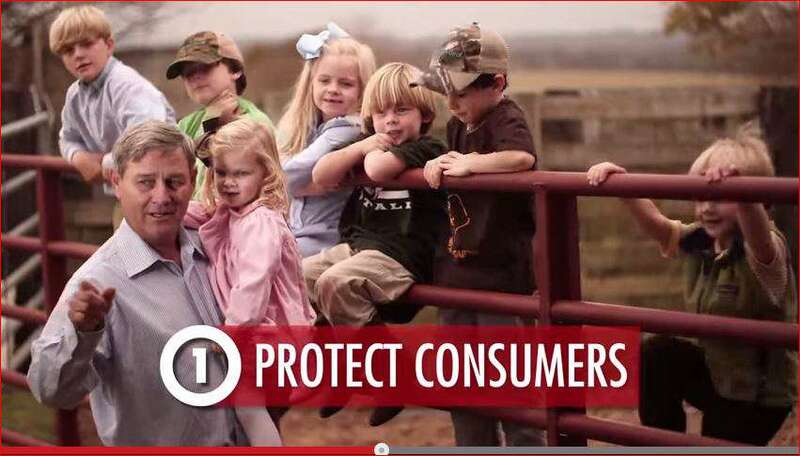 Under Alabama law, the Attorney General is charged with ensuring that utility rates are fair to consumers. The AG has the authority to call for the type of formal hearings sought by Terry Dunn that are routine in other states but which have not occurred in Alabama in more than 30 years. In 2013, PSC President Twinkle Cavanaugh and fellow Alabama Power acolyte Jeremy Oden refused Dunn’s request for such hearing. Dunn then wrote Strange to ask the attorney general to order rate hearings on Alabama Power and also for the two other utilities regulated in the manner — Mobile Gas, and Alagasco. “Big Luther” didn’t just say no, he did so in a rude fashion. His ugly, dismissive response was intended for public airing, intended to please Alabama Power by publicly humiliating Dunn. This is how Alabama’s highest ranking law enforcement officer responded to Dunn’s utterly reasonable plea for him to ensure that Alabama oversee its utility monopolies as other states do. Here’s the headline from Yellowhammer News, with its usual ugly, anti-Dunn twist, and the image of Strange that accompanied the story. 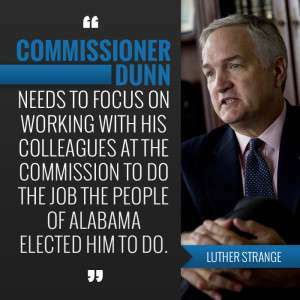 Pardon the understatement, but Luther Strange does not possess the character, political or otherwise, of Terry Dunn. On Big Luther’s watch, Alabama Power has nothing to fear. 1. When did you meet John Ross? 2. Please describe how Ross came to be involved in your campaign. 3. Do you believe it was a conflict of interest for you to allow a political consultant for Alabama Power to do extensive work on your campaign, and, with the exception of one $500 payment, at no charge to your campaign? 4. Please describe the services that Ross, as well as other members of his firm, provided to your campaign. For example, did those services include assistance with advertising? Campaign event scheduling? Fundraising and fundraisers? 5. How did you select McLaughlin & Associates to handle your campaign’s advertising services? Also, who with your campaign, communicated with McLaughlin, such as regarding decisions about crafting advertisements? Was John Ross, or anyone with his firm, Swatek Azbell Howe & Ross, involved? 6. How did you select Ashley Newman (a campaign consultant with connections to the Swatek firm who worked, and was paid, by the Beeker campaign) to provide the services she provided your campaign? 7. In each of your first three campaign finance reports — covering August, September and October of 2013 — you reported “in-kind contributions” of $2,000 from John C.M. Ross & Co. Inc. While it’s unclear exactly what services he provided, I understand — as you said yourself — that it was significant, that for all practical purposes, he was your campaign manager. 8. Why did you cease reporting in-kind contributions from Ross on your campaign reports? Why did your campaign pay him once, the $500 payment, but never again? 9. Last November, on my web-site, I wrote some stories on Ross’s firm, and reported his three in-kind contributions to your campaign. Ross did not appear again on your campaign reports. Did my report and others cause you to stop disclosing Ross’s work for your campaign? 10. Did you personally review each of your campaign filings before filing it with the Secretary of State, as required by law? If not, who did so, and signed on your behalf? 11. Do you know who paid for Ross’s expenses, including travel, lodging and meals, while he was working on your campaign? I did not expect a response, and didn’t receive one. At the start of the PSC’s January meeting — the first meeting since the rate increase — a staffer for PSC President Twinkle Cavanaugh brought out a large placard. 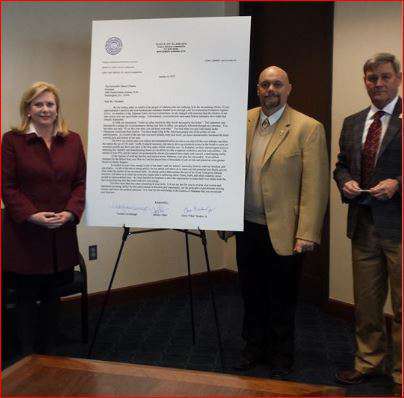 It was an enlargement of a letter that the PSC commissioners were sending to the White House. In other words, a political stunt. Cavanaugh and her fellow commissioners walked over to the placard, ceremoniously signed it, and stood for pictures. In the past, I’ve sent questions to Alabama Power and Swatek Azbell Ross & Howe and not received responses, so did not do so for this story. For a future story, I’m going to draft subpoenas to both. It will be the only subpoenas they’ll ever receive for this sordid business, but it will make me feel good. Provide the totals paid to your firm and member firms by Alabama Power, Southern Company, SouthernLINC and any related companies, such as Southern Company Services, from 2011 to the present; as well as all contracts and correspondence, including e-mails, during that same period and between all members of the firm and employees and executives of Alabama Power and its affiliates. 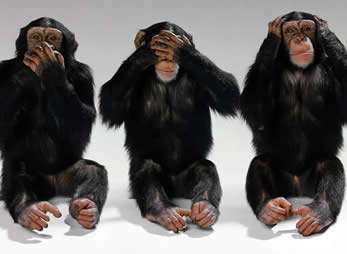 Will leave you with a couple of images from the successful campaign to get rid of Terry Dunn. This last one — applying the same cynical, calculated and false message linking Dunn to Obama and environmentalists — is the work of an outfit called, “Coal Jobs Count.” I’m working on a story on this repugnant little shill group and hope to have it soon. Information, on or off the record — especially documentation, such as financial records or correspondence — about “Coal Jobs Count,” the bogus protest or any of the sleazy activities and operators who have and continue to participate in this affair are welcome. The closer to the company financing the scheme, the better. Phone: 251-454-1911; E-mail: eddcurran@aol.com. Documentation and untraceable tips — should you be worried — can be sent to me at Eddie Curran; 133 Silverwood; Mobile, Al. 36607. If you liked this story, and want to see more like it, please consider making a donation.